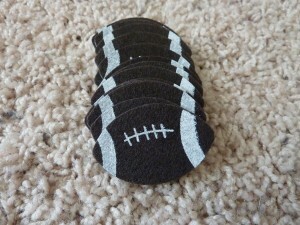 I found these really cute sports stickers at Michael’s and while they are probably meant for some art project (like a picture frame) or a scrapbook page, I got them to help build math skills like patterning, sequencing, counting and building math vocabulary. They are great because they can be used to create your own book by removing the paper and sticking them onto paper and writing in math questions but I have decided to leave the paper on them. I have used them as is or stuck on small pieces of magnetic tape to use on a magnetic surface. 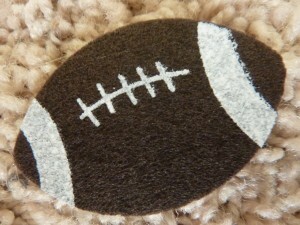 Up close photo trying to give you a sense of the texture. 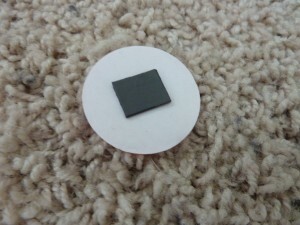 Back of sticker with piece of magnetic tape on it. 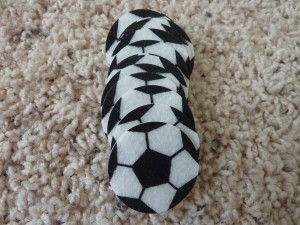 These can be used for patterning (What Comes Next? activity), sequencing (Make the Same activity), math manipulatives or creating books or book page activities as shown below. 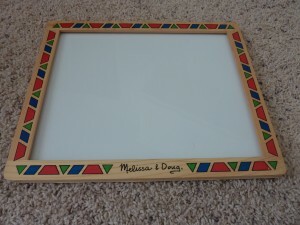 A magnetic Melissa and Doug board meant to be used with their pattern pieces but I use it as a work surface. 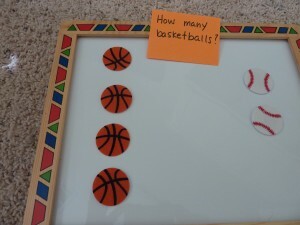 A sample station activity with a random number of basketball and baseball stickers. 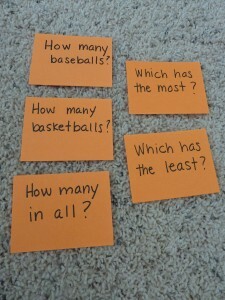 Question cards to go with activity written on small index cards. Station set up and ready to go! 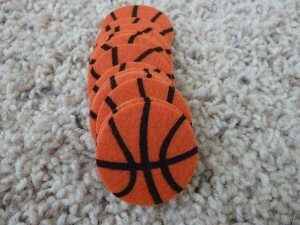 First card flipped - How many basketballs? 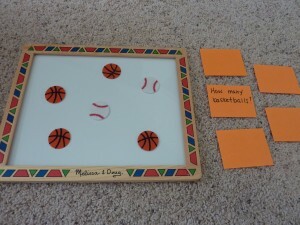 One way to help your child organize the work - separate the items to be counted. Moving them back together to answer, "How many in all?" 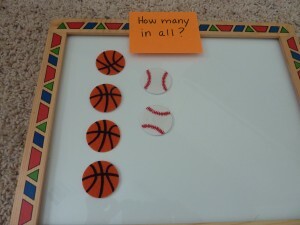 If these activities are too basic, you can use these stickers to make more challenging activities like assigning values to each ball. 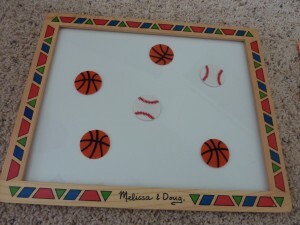 An example using the ball stickers in the photos above would be for the basketballs to have a value of 10 and the baseballs a value of 1. What is the value of the basketballs? 40. 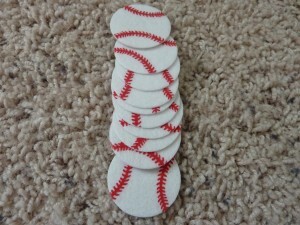 What is the value of the baseballs? 2. What is the total value? 42. Add another ball with a value of 100 or 1,000 and you can work on place value up to the thousandths place! 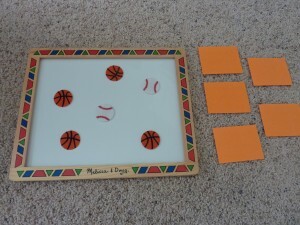 These activities are so basic yet hit on some general math concepts that are important for children to understand. I also love incorporating math language any chance I can!